A while back, I gave my initial impressions of Creativebug, the crafting website that's more or less in the same internet space as Craftsy. Today, in celebration of "back to school" for the kiddies (yay!) I'm going to show you what I made with a lesson found on their site. In June, Creativebug offered a free one month subscription without requiring a credit card, so naturally, I jumped in and did some browsing. 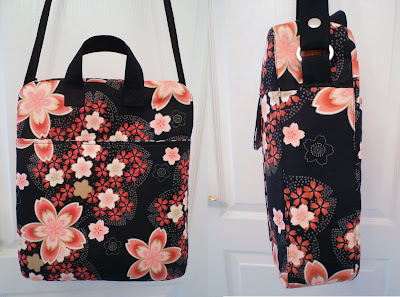 For those of you who are not familiar with Ms. White's catalogue of patterns, this Flight Bag is a variant of her Jet Pack Bag, which is a convertible backpack/shoulder bag. With a little bit of creative thought, it wouldn't be hard to add the required bits to turn the Flight Bag into a backpack, but backpacks are not my thing. I was, on the other hand, looking for an alternative to the Professional Tote for a travelling companion and really felt compelled to tackle this project for that reason (if not for the simple fact that this was a freebie and it would be a shame not to take advantage and spread the good word). So one weekend, I printed the pattern templates for the Flight Bag and spent the rest of the first day cutting, interfacing and pinning (as the video class played in the background). There are a lot of pieces. Maybe it's just that I haven't done a project this involved in a long time, but I really felt overwhelmed by the amount of prep work! It's no wonder that I have a fondness for quick and simple projects, although I totally appreciate that to make something like this, you need to put in the hours. Anyway, at the end of day one, here is what I had... all pieces cut out with Robert Kaufman Satsuki (black cherry blossom) as the main fabric, a Jysk duvet cover as the lining and some black cotton twill for the accent trim. Reminded of what I don't like about taking on big projects... so much prep! I managed to make major headway on the second day, getting to the point of completing the entire outer body and attaching the interior pocket to one of the lining pieces. The zipper was supposed to be a metal zipper but I was intrigued by one of the zippers I had in my collection and decided to use it, particularly as the colour highlights the red in the main body fabric. The interesting part is that it's a double-ended zipper normally meant for outerwear; for instance, so that you can unzip a jacket from the bottom. I figured that if I use it on this bag, then I can open it from either side. Instant added functionality! With this zipper, I can unzip from either side of the bag! This belt is going to yield some more rectangular rings! Verdict on the final result? I really like it. Actually, I'm surprised I like it as much as I do. It's simple, yet entirely functional. 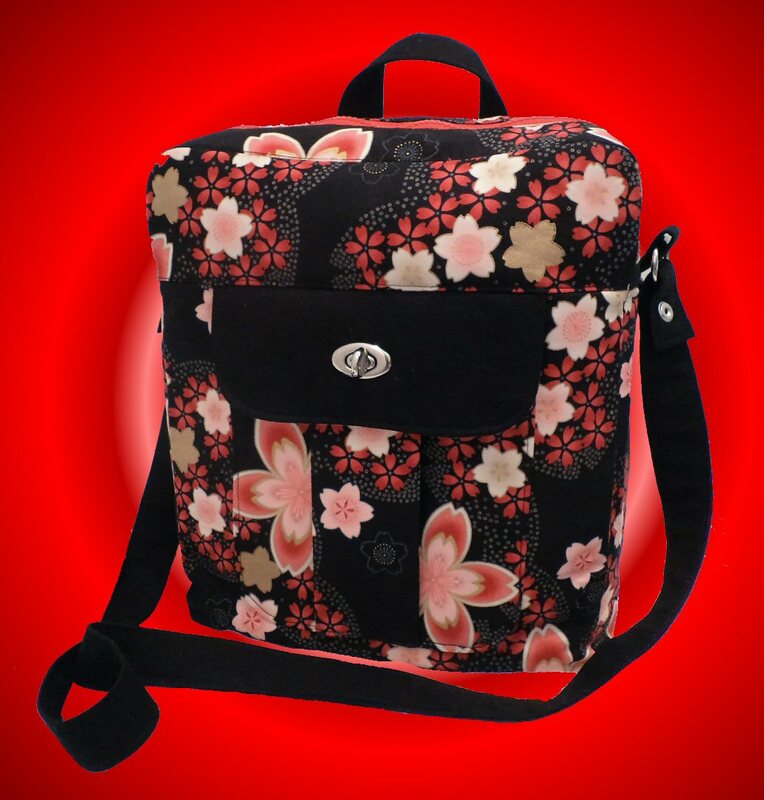 The exterior back slip pocket provides convenient access to a magazine or travel documentation. The front pocket provides secure storage for passports and such. The interior lining pocket can be customized to hold whatever you want; I sized them to accommodate my e-reader and some pens. And of course, with the wide zippered top opening, everything is kept safe inside. That's a great bag Rochelle! I don't do much traveling but like you said it would work for other times when you need to haul stuff around. I like the photo of the model showing how large the bag actually is. Is that you??? Nice fabrics too. I have made some of Betz's bags and her instructions are excellent. I'll check out the Creativebug link in a minute. You sold me on it! :) I love how your bag turned out, so I went ahead and signed up for a free trial and chose this bag as my free class. In watching so far, I love the way it's produced, and who cannot like Betz?? I'm looking forward to your review on it. Thanks for introducing me to the flight bag. Hi! Your bag is beautiful! I've started mine, but found that I am unable to locate the dimensions for the shoulder strap in the materials provided by CreativeBug. Do you know what the strap length and width fabric cutting dimensions are supposed to be? It would help me a lot! Thanks for stopping by. As to your question, if it's not in the PDF materials, I believe she would have talked about it in the video before she made hers. Try watching that section again, because I am sure it wasn't omitted.